Doris is the second to the youngest child of Wenceslao Pimentel, an Aircraft Mechanic and Leoncia Concepcion, a Grade School Teacher. Born in Zambales on the 12th of February 1963, she's married to Jun Torres and blessed with one child. Doris finished her college degree in Bachelor of Science in Business Administration major in Management at the University of the East in 1984. She started her career in freight forwarding with a German Multinational whose Philippine presence was soon taken over by STAMM INTERNATIONAL a new start up company for which she became a founding member and pioneer. 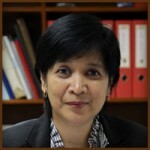 Doris has attended several Trainings and Seminars both in the Philippines and abroad. She is a beneficiary of the Training of Trainers conducted by UNESCAP and is a certified trainer in Multimodal Transport.